Power lines are among the ugliest by-products of our electronic age but the ‘cut’ also provides wonderful habitat for birds, particularly flycatchers and warblers. I’m up on Goldstream Heights, picking my way over the rocks. Before long, I’m too focussed on the calls of birds to be aware of the huge metal towers looming nearby. A Song Sparrow chips a warning – I’m the topic certainly. As I stop to take in the view of the Olympics across the Strait of Georgia in Washington state, four Band-tailed Pigeons flash by overhead, streamlined, swift flyers like all pigeons. Below them, a tropically-coloured Western Tanager flashes yellow and red, landing briefly on a distant treetop. My mind is on flying birds. Suddenly a MacGillvary’s Warbler startles me with a blast of song. He pops into view, giving me some great looks. Lovely. Even with the towers and high-voltage lines, there are worse places to be than here on a mild May morning. 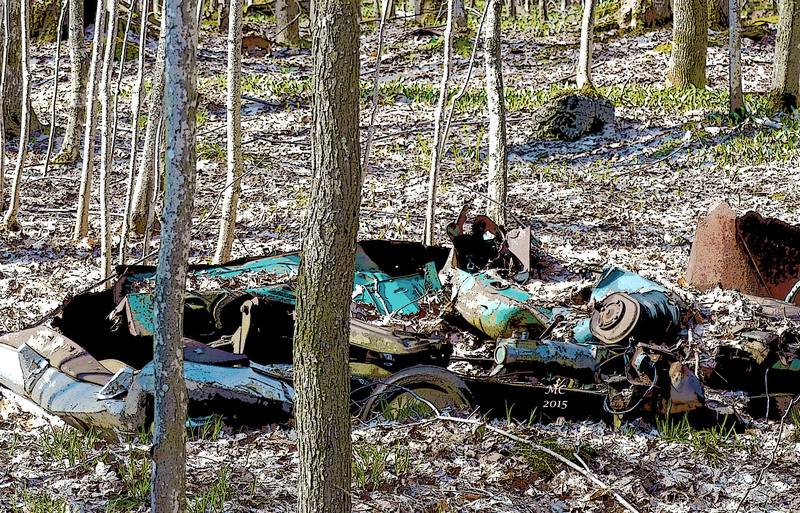 I’m not sure when I’ll ever be in these woods again, walking the once familiar nature trails near my boyhood home. I’m a stranger here now, with fewer reasons to visit. I learned years ago not to expect spring proper until May. Sure enough, we get a snow shower this morning, passing quickly but leaving cold, breezy, damp weather in its wake. I head for Hibou on the shore of Georgian Bay since the path into Bognar Marsh, my other favourite place, is too muddy for a traveller without boots. Hibou’s nice too. I soon discover that I’m the only person here. Perfect. The landscape is partially flooded and it’s hard to tell where the beaver pond ends and the rest of the forest begins. I hear the sharp warning slap of a beaver’s tail and spot the lodge. A Yellow-bellied Sapsucker drums a solo on a snag, hoping to attract a mate. Two pair of Redheads cruise the shoreline. 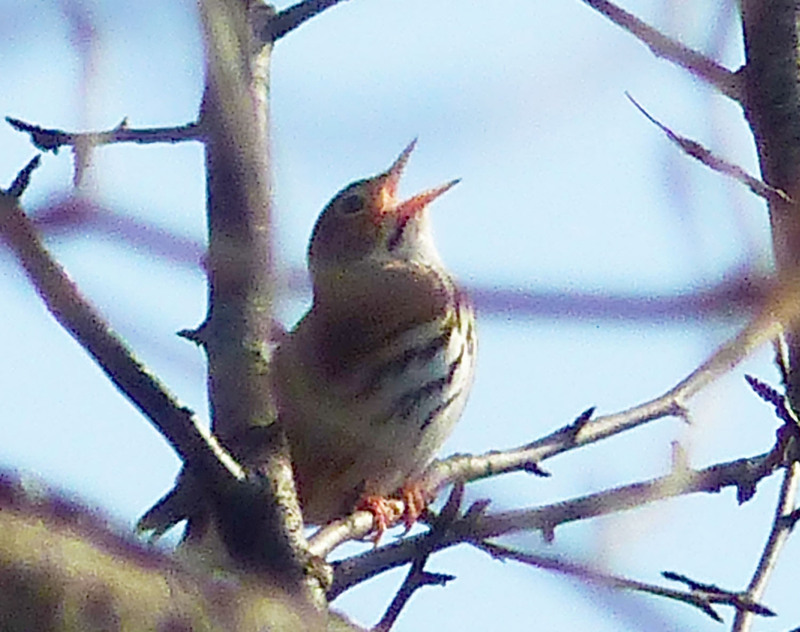 The first of the warblers have arrived – Myrtles, usually the earliest to return, and they are singing too. Cold and damp or not, there’s almost never a bad time to be in the natural world. I guess I’m starting early today. I’ve been up since first light, a hazard when you stay in cheap motels. In this case, a flaw in the drapes focussed a beam of light on my left eyeball at the wrong time in my sleep cycle. No chance of lying abed here. I rise and get dressed. This time of the morning in Owen Sound options for breakfast are limited. I get a muffin and coffee at Tim Horton’s and check my email. I likely know some of the denizens in here but, if so, they’re unrecognizable to me now after so many years. I’m visiting my mother today but we haven’t set a time and her recent memory lapses add an odd timelessness to everything. She has to eat breakfast at a regular time and has a few other things to do, I know. I’ve got time to bird and I’m up with them. Now I just have to find them. I drive out into the countryside, past the old hardwood bush where, as young teenagers, my friend Lloyd and I, having walked up the hill from the town, made a camp in the snow. It was four in the morning, a moonlit night, and we were out to hunt rabbits. Our companions were a black and tan hound puppy with ears so long it couldn’t not step on them and a beagle named Penny I’d rescued from a death sentence. It was a magical time, the fire chewing up the dry wood we fed it continually. Its light illuminated the boles of dark and massive hardwoods with each flicker or flare. I remember a Great Horned Owl hooting somewhere close by. I also remember beans cooked in the can so that one side of the mass was mouth-burning hot and the other icy cold. We did not, by the way, shoot any rabbits. Back to the present. I’ve always liked early May in southern Ontario. I grew up in this town but I’ve lived in the west for decades. Now when I come home, I come in May if I can. In a region with well-marked seasons, the land wakes up in early May. It’s winter, or close to it one day, and then, quite suddenly, it’s spring. This May, the first leaves are barely showing, no more than a haze of green-gold lights the forest. A peculiarity of the season is that sounds carry for miles. The air is hollow like a bell, like it is on a cold, still day after a snow in winter. This cold morning will become a fine spring day once the temperature gets up a bit. I head for Bognor Marsh. My brother’s best gift to me was to tell me about this place. Go out the Derry Line, he says – remember where Uncle Bob and Aunt Rene used to live. Sort of, I tell him. He’s still a local – I’m not. Well, anyway, he says, that’s kind of the area where the marsh is. You can’t miss it. Of course, you can miss it. And I do. I shuck the false confidence that comes with pretending to know my way around these back roads. I have a GPS, such a handy tool for a birder so I pull over and hook it up. A quick search and there it is, Bognor marsh, no more than a fifteen minute drive from where I am. I drive down what I guess is the right ‘Line’, pass the sign, double back and park – mine the only vehicle in small lot. The temperature is rising quickly and a little breeze becomes the first Zephyr fingers of a warm front. A week or so before there was frost; there will be wet snow one day before I leave Owen Sound. Now wildflowers carpet the shallow earth that covers the limestone and songs of a dozen bird species ring through the woods. A windfall of bird species has arrived with the warm front. Without leaves on the trees, spotting birds should be much easier. Paradise! A Rose-breasted Grosbeak streaks past. I arrange my camera and my binoculars and set out down the forest road. Bird songs are confusingly everywhere. I’m not that good with warblers anyway – certainly not with eastern warblers. I stop and find a seat on a block of dolomite and wait and watch. It doesn’t take long. An Ovenbird sings very close to me, insistent. I search and finally see him no more than 5 feet away. He moves on. I glass the surrounding brush. A male Redstart chases a female – flashes of red, yellow and white and then they’re gone. A Yellow Warbler appears and then another, and another. I count five species in as many minutes and move on. In the cedars, a pair of Black and White Warblers works the trunk like nuthatches. A pair of Scarlet Tanagers almost slip past me but the red and black male is easy to follow through the leafless trees. The weather is glorious. Pisshing brings a swarm of warblers each time – Black and Whites, Blackburnians, Ovenbirds, Yellow-rumpeds, Black-throated Greens, Northern Parula and others. I even see a Worm-eating Warbler, rare here and likely carried north on the warm front. Now I’m hearing thrushes, a Swainson’s and then the ethereal song of the ‘Swamp Angel’ – the Hermit Thrush. And there are other surprises — a Broad-winged Hawk, a tubby Evening Grosbeak, a Wild Turkey. The old road runs across the dolomite that underlies the whole county. I carry on until the forest opens and I can follow the boardwalks out into the marsh. Here, tree swallows feed and chase each other – it’s mating season after all. Their feathers catch the sun and flash an electric indigo. 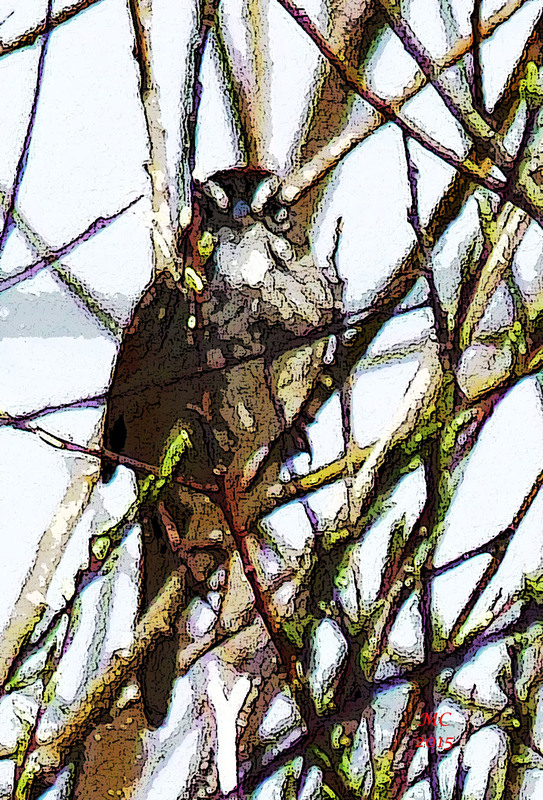 A White-throated sparrow runs up the boardwalk and perches in a low willow. Farther into the sedge, a Grasshopper Sparrow sings, if its insect-like buzz can be called a song. 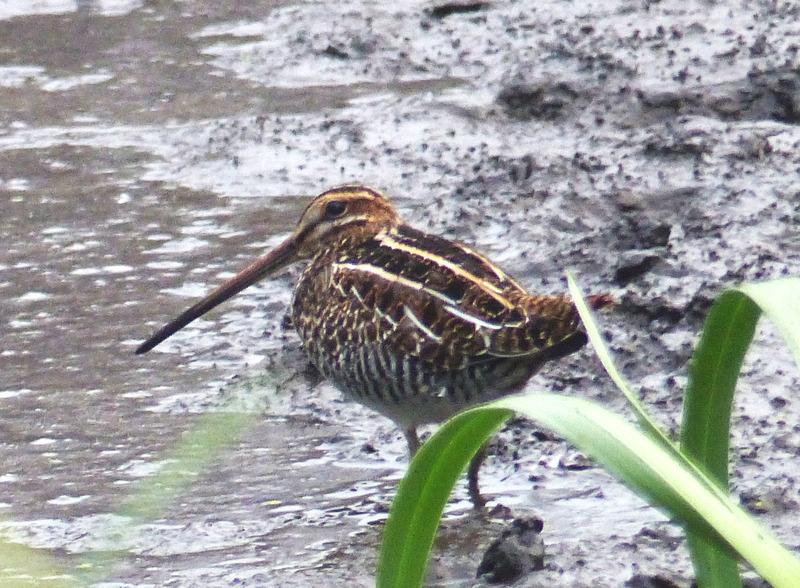 A Wilson’s Snipe flushes and buzz bombs back into cover. Others ‘winnow’ in the middle distance. I hear the clunky chortle of Sandhill Cranes and search the distant margins of the marsh for the source. I finally spot the bird, its back a rusty-brown, strutting and preening. Two more cranes fly overhead. Another Broad-winged Hawk appears going north and then disappears, its flight obscured by the surrounding trees. I remember that I’m supposed to be picking up my mother and, reluctantly, I leave. I’ll come back as often as I’m able. My mother seems to think that when I arrive is when I was supposed to arrive. I don’t correct her. I’m sinning in that regard and I know it. Later, on our drive, I spot a Peregrine and, a few miles on, a Merlin. Not bad for good old Owen Sound. I’m back at the Marsh on each of the next four mornings.The birds are different each morning and it takes real willpower to leave each time when I ought to. May, that’s the time to be there.